We’ve developed a series of Sparky video clips that reinforce important home escape planning and practice messages. Feel free to use the clips to promote this year’s campaign on social media, during classroom visits, or however they best serves your needs. In the video above, Sparky says know two ways out of every room. See all the videos. Introduce Fire Prevention Week to students, your community, or areas with high-risk populations. NFPA has several free downloads for you to use. See all of NFPA's FPW teaching materials. 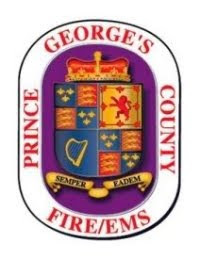 By the end of the mini-lesson, attendees should be able to explain the importance of a home fire escape plan and have at least two ways out of every room. Use creativity while learning a valuable lesson - Plan 2 ways out of every room. Both kids and adults will enjoy coloring this sheet. Whether it is sending a news release to your local media, using the FPW logo on social media channels, or having an open house at your fire station, there are many ways to promote this year's FPW campaign. See what you can do in your community, school, or at your fire department. Test your knowledge about home fire escape planning and other fire safety topics. Then, share your results on social media. You can place this infographic on your website, blogs, Facebook or Twitter. Or, print it, and hand it out. Please link to www.firepreventionweek.org. We have the products you need to make your FPW campaign a success. Get a "FPW in a Box" or custom select what you need. Check out our must-have products. 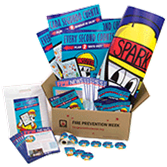 The 2017 FPW™ In A Box™ Value Pack is everything you need to make Fire Prevention Week™ a success! 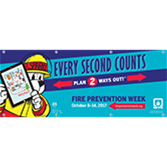 Give working smoke alarms top billing in your community with 2017 Fire Prevention Week™ Banners!